Convexity defects and how to find them. We saw what is convex hull in second chapter about contours. Any deviation of the object from this hull can be considered as convexity defect. Remember we have to pass returnPoints = False while finding convex hull, in order to find convexity defects. It returns an array where each row contains these values - [ start point, end point, farthest point, approximate distance to farthest point ]. We can visualize it using an image. We draw a line joining start point and end point, then draw a circle at the farthest point. Remember first three values returned are indices of cnt. So we have to bring those values from cnt. This function finds the shortest distance between a point in the image and a contour. It returns the distance which is negative when point is outside the contour, positive when point is inside and zero if point is on the contour. In the function, third argument is measureDist. If it is True, it finds the signed distance. 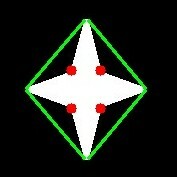 If False, it finds whether the point is inside or outside or on the contour (it returns +1, -1, 0 respectively). If you don't want to find the distance, make sure third argument is False, because, it is a time consuming process. So, making it False gives about 2-3X speedup. OpenCV comes with a function cv.matchShapes() which enables us to compare two shapes, or two contours and returns a metric showing the similarity. The lower the result, the better match it is. It is calculated based on the hu-moment values. Different measurement methods are explained in the docs. See, even image rotation doesn't affect much on this comparison. Hu-Moments are seven moments invariant to translation, rotation and scale. Seventh one is skew-invariant. Those values can be found using cv.HuMoments() function. Check the documentation for cv.pointPolygonTest(), you can find a nice image in Red and Blue color. It represents the distance from all pixels to the white curve on it. All pixels inside curve is blue depending on the distance. Similarly outside points are red. Contour edges are marked with White. So problem is simple. Write a code to create such a representation of distance.